Haus of Girls: Fall Flashback Week: A Zebra and a Horse, of Course! Fall Flashback Week: A Zebra and a Horse, of Course! *This week I wanted to do a “Fall Flashback” and re-post some of my favorites from the past two years, just in case you missed them. Here is another favorite, A Zebra and a Horse, of Course! I mean REALLY loves them. (you can check out her bedroom tour here in case you missed it the first time) and she’s always talking about how she would love to own her very own horse one day, and be a “horseback” rider when she grows up. So last Friday night, Steve sat down and randomly drew a horse pattern for me. He thought it would make for some fun new shirts for the girls. And how cute did our shirts turn out. Total Teamwork, Mom and Dad Style. Sophie loved the zebras at the zoo last weekend, so we got two animals for the price of one. Holla! As we sat at the table crafting and drawing together, we looked at each other and talked about how our "Friday night fun" is so different compared to eight years ago. 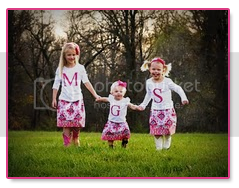 Now, creating fun stuff for our three girls is our Friday night excitement. Steve said, after taking a sip of his brewskie, "I wouldn't have it any other way."